Calendula natural, handmade soap is unscented with added organic calendula petals. 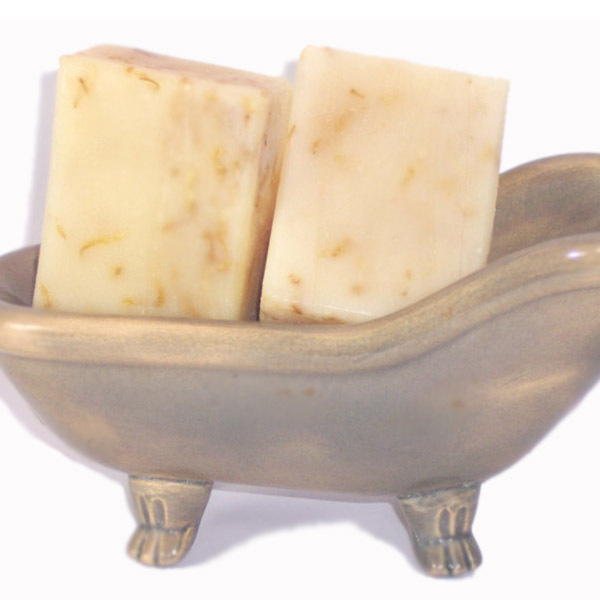 This artisan soap is beneficial for sensitive skin and has mild, gentle creamy bubbles. Buy a bar for your baby or get one for any special occasion like Christmas. Calendula Artisan Handmade Soap is unscented, mild, natural, botanical soap that can be used by anyone. It is unscented. The soap will clean gently, thoroughly and will not strip the skin of natural moisture. The calendula petals are organically grown and dried. The flower petals are separated and added by hand to each batch. Calendula is the only flower that will stay a pretty yellow in cold process soaps. Calendula soap has neither artificial fragrance nor any added color. It has been used successfully for sensitive skin or on babies, toddlers and children. This soap is cured for 6 weeks. This makes the soap extra mild, the water from the soapmaking process evaporates and it will give it a longer shelf life. Use this soap in the bath, shower or at the kitchen sink. It’s best to let your soap dry between uses, or use a soap dish that drains. This soap contains no shea butter for those with allergies. It comes in a soap box with a full ingredient list. Calendula natural botanical soap would make a wonderful gift for a new baby, a baby shower or anyone with sensitive skin. Buy this soap and put a smile on your baby’s face and a joy to your heart. Ingr: Virgin Olive oil, Coconut, Palm Kernel, Mango Butter, Castor oil, Soybean, Sodium Hydroxide, Beeswax, Organic Calendula petals. No color or scent added.